Thermo insulation is the standard on all INSTA-CLEAN parts washers saving on energy costs. Oil Skimmers have thick 11 GA Stainless steel discs and scraper blades. Parts washers with build on oil skimmers have a shutter door inside the washer, keeping oil skimmer side of parts washer clean. Industrial rated seal-less pumps are standard, no pump seals to leak. INSTA-CLEAN models IC-7, and IC-10 are designed with parts trays that roll completely out onto the door, making it assessable from three sides. Easy loading of even the heaviest of parts to be cleaned. INSTA-CLEAN models IC-4 and IC-7 are supplied with an electric cord and wall receptacle. 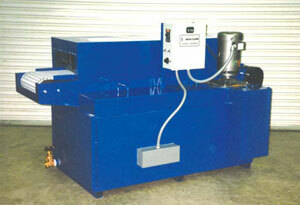 INSTA-CLEAN parts washers are painted with an industrial grade polyurethane (rubber) coating. Long lasting and chemical resistant. Full port 2" valves are standard on models IC-7 and IC-10. Since 1977 INSTA-CLEAN has been Manufacturing Parts Washers with high standards. Sound Designs and quality materials have given INSTA-CLEAN a reputation of producing equipment that will last. You can depend on INSTA-CLEAN sales, parts, and technical staff for fast and courteous service. At INSTA-CLEAN your satisfaction is important to us. Our product testing staff performs extensive tests to assure that our products will perform to high standards and give long service life. Every parts washer built by INSTA-CLEAN is filled with water and tested to assure that there are no leaks and that all components work properly. If a component should fail during the warranty period, INSTA-CLEAN, in most cases, can guarantee overnight delivery of replacement parts. The WARRANTY on Models IC-4, IC-7, IC-10 is 3-YEARS on all parts.